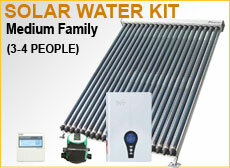 WaterTechSolar.com is the premier online store for Solar Water Heaters : Do It Yourself Solar Water Heaters. Are you looking for a reliable, eco-friendly way to lower your energy costs? WaterTechSolar.com's solar water heating systems are the best way to go green and save! This efficient method of heating water is a big step forward to making your home "green" at a fraction of the price. 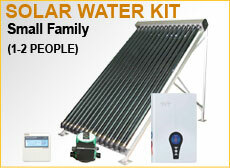 WaterTechSolar.com solar water heating units can be purchased via an entire kit or you can browse through the options and build a customized system. If you still have questions WaterTechSolar.com is here to provide the support you need for both selecting and installing your system. Our U.S. based technical support is available from 9 a.m. to 9 p.m., seven days a week. For those seeking easy DIY guidance, we've complied a step-by-step tutorial complete with photos and videos. You can see just how clear-cut installing your own system can be. Many homeowners require about an afternoon to set up and then they reap the rewards for years. Now is your wake up call to start living green: begin today by selecting your WaterTechSolar.com water heating system! To help take some of the guess work away we provide Accu-Choice; an easy to use question and answer tutorial that helps the everyday homeowner select their optimal solar water heating system. Simply by answering a few questions, such as the amount of people living in your residence, Accu-Choice will analyze figures and output a customized recommendation. Our savings calculator helps project the long term benefits of installing one of our solar water heating systems. Just input a few figures and the calculator computes your estimated savings over the course of twenty years. When part of a flat panel breaks, it no longer works. Entire unit must be replaced. When an evacuated tube breaks, the unit still functions. 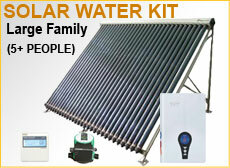 Replacement parts are offered on WaterTechSolar.com. Wind hits the flat panel dead on. High winds potentially cause it to dislodge from frame. Evacuated tubes have better aerodynamics. The wind moves around the curves of the unit causing less strain on the unit. A flat panel can only absorb solar energy when it is perpendicular the sun. This allows a short window of time to absorb the sun's rays. The raised and round shape of the tubes are able to take in the sun's rays at multiple angles due to greater surface area. As the sun moves, it still reaches different exposed angles of the tube. This gives more opportunity for absorption. Flat panels don't absorb well in overcast conditions. They struggle in subzero temperatures. Evacuated tubes perform in overcast conditions & are built to withstand subzero temperatures. Requires more space on roof. Takes up less space on roof. Can be covered by snow in colder temperatures, blocking its function. Gaps between tubes enable snow to fall through (or melt and drip down through the gap). Flat panels loose heat when the liquid in the unit reaches a temperature above the ambient. Evacuated tubes maintain performance in high temperatures, even when temperatures extended above the ambient. The panel's exterior can become extremely hot. As a layered system the tubes absorb heat & keep it inside rather then allow for heat dispersal. The exterior will not be as hot its flat panel counterpart. How Do Your Solar Water Heating Systems Work? Essentially, several units (control panel, pump, solar collector etc.) work in sync to collect the sun's light and heat the water. It has smart sensors: one is temperature sensitive detecting whether the water is hot; the other is "flow" sensitive, alerting the unit when hot water is being used and needs to make more. It does all the hard work on its own, with minimal maintenance. Will the System Work on a Cloudy Day? Yes! There is an electronically intuitive back-up heater that only clicks on when needed. There are three back-up heating options in various kilowatts to fit your needs. This is the most up to date method of solar water heating - cold showers on a rainy day are a thing of the past! There are multiple reasons solar water heating is the way to go. Specifically, it is an earth-friendly way to run a part of your homes infrastructure; it reduces your dependence on outside energy resources by working in consort with nature; it can save money in the long term. 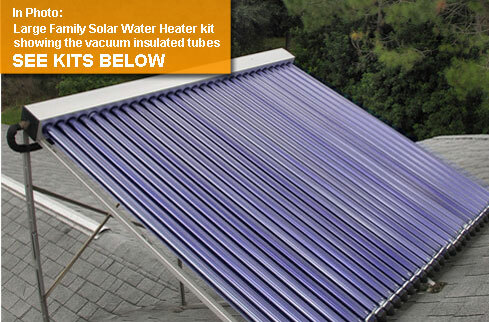 Learn how you'll make a real difference by investing in a solar water heating unit. Is there Government Funding for Solar Energy? Actually, there are several options to help you recoup some of your initial investment. These potential sources include; tax credits, grants, and gov't rebates. Some local counties or cities offer their own incentives. To help save you time we have complied a few helpful links.